While La Machine might have been the most amazing street spectacle ever to visit Ottawa (no hyperbole here!) it’s not too late to visit Ottawa’s other fabulous FREE summer shows. If you’re into light shows, I hear Kontinuum and the Northern Lights show on Parliament Hill are both awesome, but we were blown away (again!) 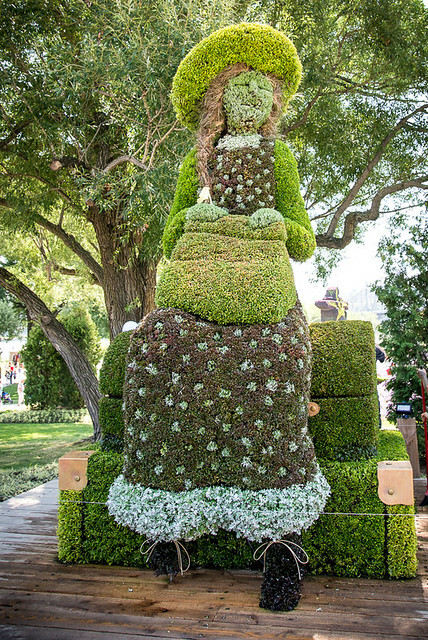 by the spectacle that is MosaiCanada. 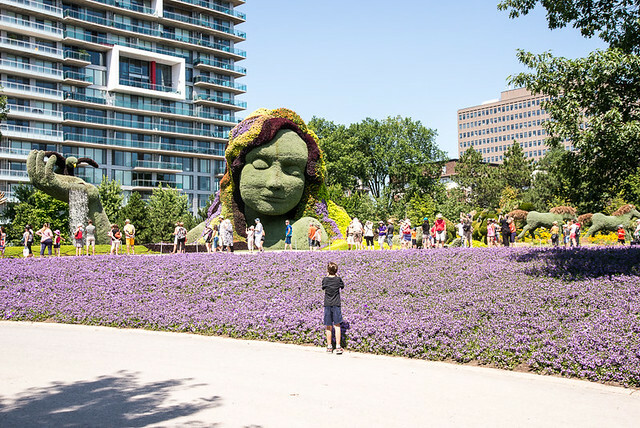 What is MosaiCanada? 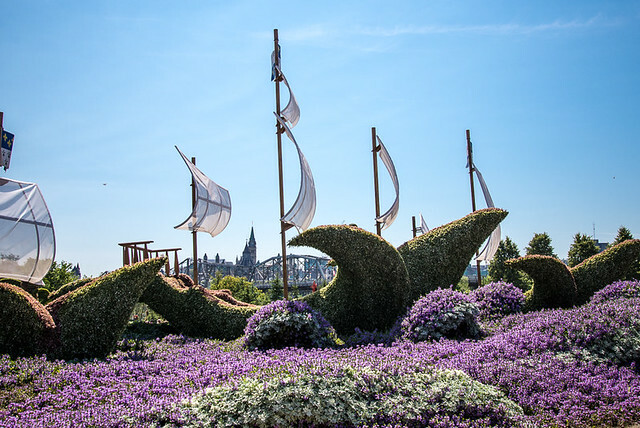 A beautiful tribute to Canadian culture embodied in the most amazing living sculptures, created from millions of annual plants and flowers. You are led on a wandering path past a life-sized replica of a CP rail station and passenger train with steam locomotive, past dragons and foxes and prospectors and totems and hockey players and Mother Earth herself. I loved it, the kids loved it. It was terribly hot, blazingly sunny and ridiculously crowded the day we went, and we still loved it. Tristan loved the dragons with their Asian flair (sadly, not quite as cool as Long Ma), Simon liked the hockey players and the northern lights, and Lucas loved Mother Earth so much that he asked to borrow my phone so he could take his own photo of her. Though I loved Mother Earth in her majesty, and Anne of Green Gables waiting patiently outside the station on her suitcases, it was the tiny details I loved most – the play of colours, the way the sculptures interacted with one another, the incredible detail in each piece. Really, I only took a few photos because it’s the kind of thing that pictures simply cannot do justice. You need to experience it in real life to get it. This is a perfect adventure for families of all ages and sizes. The paths are wide and stroller-friendly, and there are benches often if one neds to stop and rest, as well as plenty of seats in the shade. Kids can wander, within reason, and can get quite close before the rope barriers remind them not to touch. The colours are breathtaking, and the flowers achingly beautiful. It took us a little shy of two hours including a four-block walk to and from parking on a busy summer morning to take it in. And it’s FREE! Parking can be expensive, but we found free two hour parking on the streets just north of Jacques Cartier Park on a Tuesday morning. This one is definitely worth a morning or afternoon out – I’ll be heading back in the fall to see if or how the seasons change the sculptures. 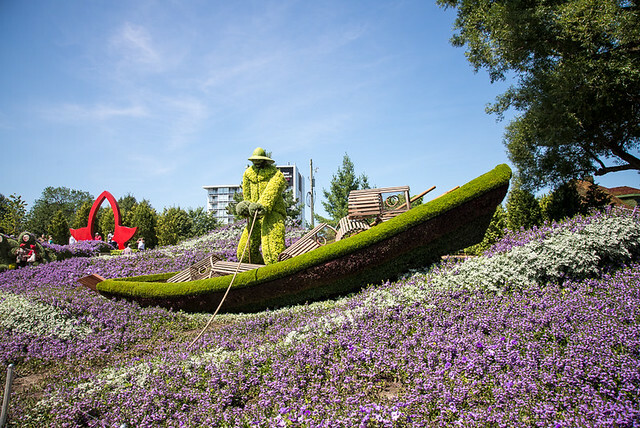 If you go: MosaiCanada is at Jacques Cartier Park in Gatineau through October 15, 2017. It’s open 10 am to 7 pm every day. Admission is free, but expect a queue during peak times. Guided tours are available for $10 (we just read the plentiful signs near each sculpture.) Parking on site is $20, but there are less expensive and free options within a three or four block walk. 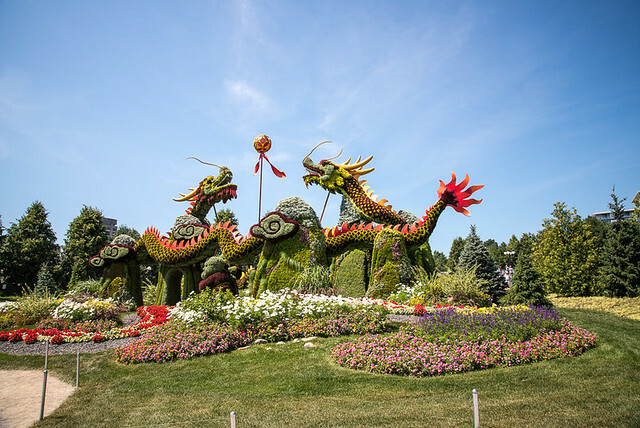 See the MosaiCanada site for more details. We went yesterday, too. Sad to say, my early teens were Not! Impressed! and spent most of the time sitting in the shade and being cranky. My youngest had a bit of a more positive attitude but even so, couldn’t wait to get out of there and move on to the ice cream portion of the day. I’ll have to go back when it’s just me, so I can appreciate it!